Speaking about their upcoming games, Ramos said it would be a huge month for Madrid. Cristiano Ronaldo and Sergio Ramos. 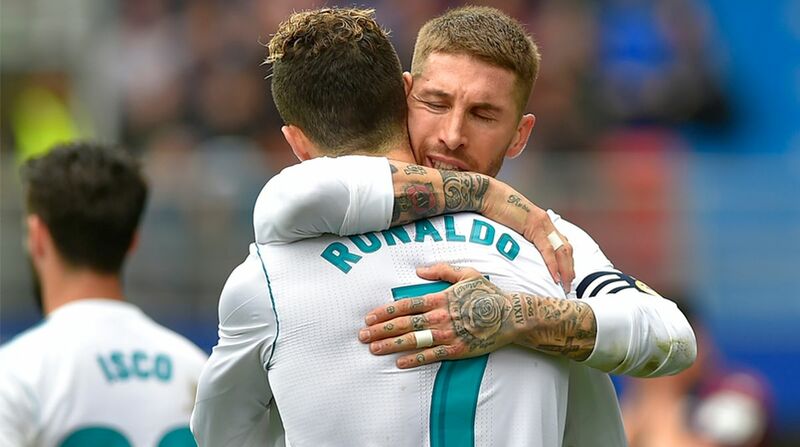 Real Madrid skipper Sergio Ramos is delighted to have been given penalty-taking responsibilities following the departure of five-time Ballon d’Or winner Cristiano Ronaldo from La Liga giants for Juventus. The defender has been on spot-kick duties for Los Blancos since Ronaldo left Madrid in July. So far, Ramos has scored 10 goals, which is also his equal most in a campaign, in the ongoing season of La Liga. Ramos also insisted that he never wanted to offend when he opted for the ‘Panenka’ from the spot. A BIG month ahead for @RealMadrid! The upcoming three weeks would be crucial for Madrid as they are preparing for a few big clashes, including a Copa del Rey semi-final and league clash against Barcelona, a meeting with Atletico Madrid and Champions League tie against Ajax. Real Madrid will next take on Barcelona on Thursday in La Liga match where they sit third, 8 points adrift of leaders Barcelona. “We are facing Barcelona, who are the leaders in LaLiga, and our rivals in the cup,” Ramos said.